A family fishing outing at the lake. Catching a fish never fails to excite, especially if you’re a child. Reeling in one of these wiggly wonders has never been easier in Texas urban areas. That’s because places for family fishing fun are in, or near, your neighborhoods…as are the opportunities for gaining the skills necessary for catching the fish. 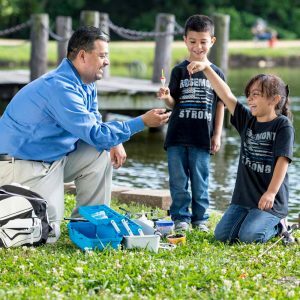 Texas Parks and Wildlife’s Neighborhood Fishin’ program brings the fish to you. Currently, eighteen neighborhood fishin’ lakes are dispersed among eleven Texas cities: from Abilene to Houston and points in between. Stocking takes place every two to four weeks during summer and winter seasons. Which means there should be a good supply of fish to catch and bring home for dinner whenever you find time to visit! In addition to the Neighborhood Fishin’ program, state parks host fishing events where you learn about the best gear and bait to use, how to cast, and even how to cook what you catch. Some parks also loan tackle. Fishing is a gateway activity into the Texas outdoors, and something the entire family can share together. Find a list of the Neighborhood Fishin’ lakes on the Texas Parks and Wildlife website. While you’re there, check out the calendar section for fishing events near you. This entry was posted on Thursday, September 13th, 2018 at 12:00 am	and is filed under Fishing, Learn to fish, Neighborhood Fishin', SFWR. You can follow any responses to this entry through the RSS 2.0 feed. You can skip to the end and leave a response. Pinging is currently not allowed.